The Fleas will entertain at the opening reception for the Brownstone Arts Summer Solstice art exhibition, which will be held in the Mary Flood Room at the Portland Library. Admission free! Come enjoy the art and the music. The exhibit runs from June 6th through July 29th. For more information, call the library at 860-342-6770. 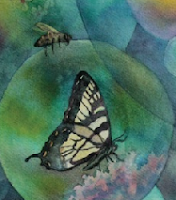 Art detail from In the Depths of Summer, watercolor by Dawn Brindle. We'll be appearing with our larger band, Roswell and the Ukulaliens to celebrate New York's 4ooth anniversary. Watch the tall ships pass on their way up the Hudson River, enjoy a picnic by the water, and a lineup of bands starting at 2 pm and going until 8 pm. Free admission! Roswell and the Ukulaliens: Greg Doyle, guitar; Wendy Matthews, ukulele; John Monten, bass; Pete Zacagnino, ukulele; Paul Cundari, ukulele.